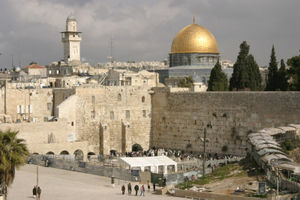 There's a popular song about the City of Jerusalem called "Yerushalayim Shel Zahav" (Jerusalem of Gold). The chorus goes: "Jerusalem of gold and of bronze and of light...etc etc etc". You might think, at first glance, that these things are the same in the world of poetic and artistic expression. I.e. that saying 'jerusalem of gold' is the same as saying 'jerusalem of bronze', but really these things are not the same. How can something be made of gold, widely valued as the most precious metal in the world, and of bronze, a mixed alloy made essentially of copper and tin ('the tin content not exceeding 11%,', according to dictionary.com), at the same time? Either the holy city of Jerusalem is made of pure gold, bright and beautiful, sought after for centuries by princes and paupers alike, or it is made of a base metallic mixture which could include any number of alloys, so long as copper is the main ingredient. Now, allow me to explain the point. I have now been here, as an Israeli citizen and a semi-resident of Jerusalem for less than two weeks (11 days, to be exact), and, although I do not claim to be, in any way shape or form, an expert on these things, certain things are clear enough that one does not have to be a rocket scientist to perceive and understand. The song holds a certain truth, essential for beginning to understand the atmosphere, the culture and the politics of this city. Jerusalem is a city of gold. It is beautiful, shiny and precious. Its white stone literally sparkles in the sun. But, just like gold, this external beauty is deceiving. Jerusalem is not made only of gold. It has a baser nature, often lost to tourists and golddiggers stuck in the beauty of its romantic facade. Jerusalem is made of bronze, as well. It has crime and pollution and destructively violent religious fanaticism. It has weirdos and rapists and trash everywhere (large-scale recycling has yet to make its way to the region). From what I have seen, Jerusalem is, above all, a city of tension. It has been called a pressure-cooker. This is an understatement. From where does the tension come? Every. direction. imaginable. The most common relationship talked about is that of the Israelis and Palestinians or the Jews and the Arabs. To be sure, this tension exists, but it is much more complicated that that. I have seen the tension between the religious Jews and the secular Jews, between the natural-born Israelis and the immigrants (even those who have been in the country for twenty years), between the old and the young, between men and women, between the left and the right and the moderate, and much, much more. There is tension between different sects of religious groups, Jewish and Christian (and Muslim I am sure, though I have not seen it first-hand yet). Perhaps you have been glancing at the news and have read or heard something about the gay-pride parade/rally scheduled to take place in Jerusalem at this very moment (Friday midday) which has been protested vehemently (and sometimes violently) by the haredi orthodox in Israel. This is another stark example of the tension, and this is not as simple as a conflict between the religious and the secular. According to surveys about which I've read in the Jerusalem Post, there are many people who feel such as I do: for the sake of democracy, freedom of expression, and freedom of and from religion, the parade/rally must be allowed to take place. However, for the sake of peace and respect for the religious sensibilites of others (even if the belief is not shared), the parade does not have to take place in Jerusalem. It has always taken place in Tel Aviv. Let it take place in Tel Aviv, the cultural capital of Israel. Moreover, even if the religious have a legitimate argument and protest point, engaging in violent protest (burning cars and throwing rocks at fellow Jews) is counterproductive and gives them, without any help from the media, the stigma that they detest and decry. There are hundreds more examples I could cite. I will be posting more on this in the future. I wanted to give you a picture of the atmosphere I have experienced so far. Please comment if you have something to say or wish to respond. this is all media-ated for effect. You seen this stuff happening in Mea She'arim? I haven't personally seen this happening in Mea She'arim, but I have personally been in traffic jams as a result of the protests and some of my classmates have cited the protests as reason for their tardiness to ulpan. I did see this picture in the jPost, though. I would say it is very strongly media-ated, but one cannot deny the emotional effect. That's just what they had in mind, isn't it?